Maria Cole had her own long singing career, performing with greats such as Count Basie and Duke Ellington. 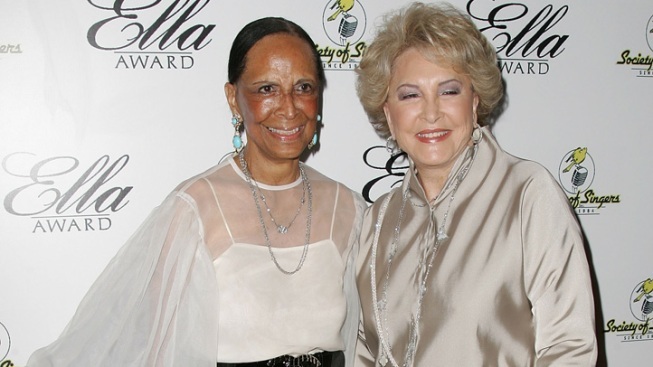 Maria Hawkins Cole (L) pictured here with Virginia Mancini, the wife of Henry Mancini, was a singer herself and performed with her husband throughout the '50s. Maria Hawkins Cole, widow of jazz crooner Nat "King" Cole and mother of singer Natalie Cole, has died in South Florida after a short battle with cancer. She was 89. A representative of the family confirmed that she died Tuesday at a Boca Raton hospice, surrounded by her family. Before and after marrying the famed singer and piano player, Maria Cole had her own long singing career, performing with greats such as Count Basie and Duke Ellington. According to her family, Ellington heard recordings of Maria Cole singing and hired her as a vocalist with his orchestra. She stayed with him until 1946 when she began soloing at the city's Club Zanzibar as an opening act for the Mills Brothers. There she met Nat "King" Cole. The two were married in 1948 by then-U.S. Rep. Adam Clayton Powell Jr. at Harlem's Abyssinian Baptist Church. Maria Cole traveled and performed with her husband throughout the '50s. After her husband died from cancer in 1965, Maria Cole created the Cole Cancer Foundation. Her children, Natalie, Timolin and Casey Cole, said in a joint statement, "Our mom was in a class all by herself. She epitomized, class, elegance, and truly defined what it is to be a real lady. ... She died how she lived — with great strength, courage and dignity, surrounded by her loving family." At the time of her death Maria Cole lived in Ponte Vedra Beach, Fla. Private services will be held in Glendale, Calif.